Ottawa County’s Farmland Preservation Program is a voluntary program that preserves farmland by purchasing or receiving donations of development rights from an actively farmed property. Landowners are compensated for lost development potential, yet still own the land and retain all other rights associated with it. The land must continue to be used for agricultural purposes, or remain in a natural state perpetually regardless of transfer or sale of property. The Hehl Farm, owned by Matt and Amy Hehl, is a 34.9 acre hog and cattle farm in Polkton Township. In addition to being the first farm permanently preserved by the Ottawa County PDR Program, the farm is also a certified centennial farm. 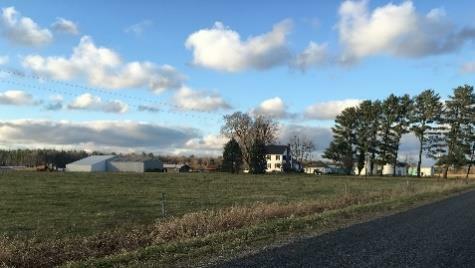 Eligible farmland must be located within Ottawa County in a participating city, village or township that have adopted a resolution in support of the Farmland Preservation Program. The landowner is required to donate at least 25% of the Fair Market Value of the parcel(s) to the purchase price of the easement. Farmers are paid the balance of the Fair Market Value of the easement purchase from the Ottawa County Farmland Preservation Program funds (which are comprised of private donations) and matching state and federal grants designated for farmland preservation. Ottawa County works in conjunction with the Michigan Natural Resources Conservation Service to assist farmers in obtaining a matching grant for the easement on their property. The United States Department of Agriculture matches up to 50% of the funds to purchase a Farmland Preservation Program easement on selected, qualified properties. If you are interested in permanently preserving your farmland, the first step is to complete this brief pre-application form and submit it to plan@miottawa.org. A member of our staff will contact you to confirm that your property is eligible, assist you with completing the full application form, and answer any questions you might have about selling the development rights to your farmland. The Ottawa County Agricultural Preservation Board will then review and prioritize applications based on Scoring Criteria and available funds. The Agricultural Preservation Board is the governing board over the Farmland Preservation Program. Public meetings are held the first Wednesday of the month at 8:00am at the Fillmore Street Complex.